Before I saw Jackie — a masterclass in filmmaking, vision and Americana subversion (more on that later)— I was ready to rave about Anne Hathaway's twisted part-addiction movie, part-monster movie, all dark comedy Colossal as being the most unique and memorable movie of TIFF. But, then Natalie gave me goosebumps for 90 minutes straight in a career-best performance (yes, better than Closer or Black Swan or Leon or Free Zone or [sheepishly] No Strings Attached). So now we're here. But that does not take away from the fact that Anne Hathaway is great in Colossal. Let's get one thing straight: this movie is totally strange and does not make any sense, but you just have to let the weird wash over you. It's not for everybody, but I loved how original it was, and producing the red carpet interviews and one-on-one interviews for the movie made me love it even more. 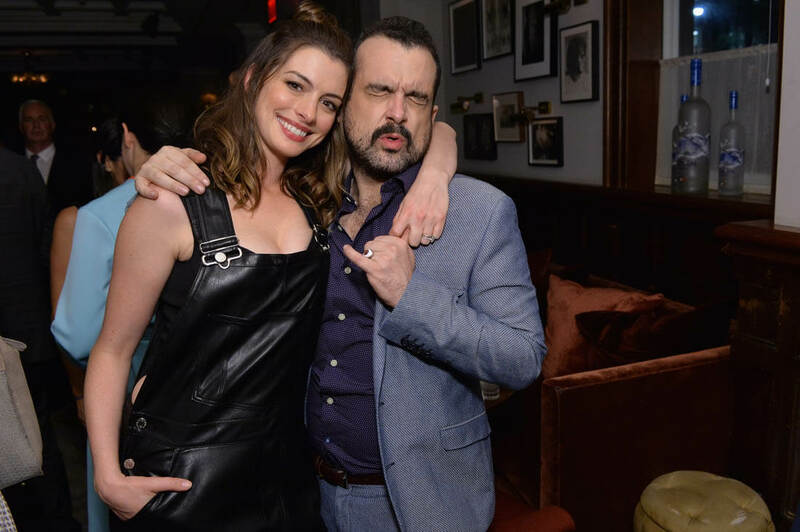 The cast — Anne Hathaway and Jason Sudeikis — is into it too. When they walked the red carpet, they told us that they loved how unique the story is, and praised director Nacho Vigalondo's vision... and weirdness. Anne plays Gloria, an alcoholic blogger-slash-columnist who moves from New York to Jersey when a particularly bad bender leads to a temporary breakup with her boyfriend (Dan Stevens). He scolds her, so she moves back home. There, she quickly reconnects with her childhood friend (Jason Sudeikis), who offers her a job at his bar and soon, they start hanging out every single night. You suspect they have a strained yet nostalgic history, but you can't really pinpoint why they did not keep in touch until later in the movie. All of a sudden, a Godzilla-like monster starts terrorizing Seoul. Gloria seems particularly grief-stricken about this global tragedy, and quickly finds out that she is actually the person controlling the monster's movements when she visits a nearby park at 8:05 AM Eastern Standard Time each morning... after yet another bender. Tortured by the guilt, she literally faces her own demons and tries to stop drinking but quickly, Jason's character begins to show his true colours and sinister intentions regarding Gloria's sobriety... and turns into a monster himself, in more ways than one. Well, a robot. He becomes an evil villain, and also begins to attack Seoul at 8:05 A.M. with Gloria, when all she wants to do is apologize to anybody she's hurt. The monsters they embody? They are the characters' childhood toys. Weird, right? I know. It's not perfect. But it works. Supporting turns from Austin Stowell (he's just destined for a breakout role sooner rather than later) and Tim Blake Nelson further the story too. Anne and Jason love each other. In our extended etalk interviews, they rave about each other and credit SNL and Anne's hosting gigs with bringing them together. In fact, Jason says his appearances in sketches with Anne on the show helped launch his comedic career beyond TV. They also were super friendly at the after-party. Anne's husband Adam Shulman was there as was Olivia Wilde, who was sipping on ice water like it was a martini. Anne rocked black Givenchy leather overalls, trounced around barefoot and was very friendly to everybody, stopping to talk to everyone, even strangers, asking them their thoughts on the film. Elizabeth Olsen was there too, as she and Jason are filming together in Toronto. And that lingering Hatha-hate? She's trying to appear less over-the-top and spontaneous. She's trying to be more "real" and down to earth." Only a casual Oscar winner would rock leather overalls and a top knot at an after-party, right? Anne had to cancel some interviews on Friday due to traffic in Toronto, but on the red carpet that night? She made up for it, and even admitted to etalk's Danielle Graham that she had a hard and stressful day being away from her baby. Click here to watch the interview. Anne is trying to be flexible. She's trying to work hard and "have it all." I want believe in her. She's officially converted me back to being in her corner, and not just because I got to tell her how much I loved her in the 1999 FOX series Get Real, but because of the way she carried herself all weekend long beyond any of her performances. The work stands strong, and so does her will to stop people pleasing and just be herself. I love this Anne. And, how's this interview for a palate cleanser? Anne talks about what it's going to be like to sit in the makeup trailer for Oceans Eight.